In what is perhaps the ultimate annual shareholder meeting movie scene, corporate raider Gordon Gekko in Wall Street takes control of the meeting and declares greed to be good. Now that proxy season is underway, it is also an opportune moment to reconsider the film's themes and plot perhaps as we compare it to real life. At the highest level, the movie has very little to do with community banking. For example, work done by the FDIC to define community banks finds they are "more likely to be privately owned and locally controlled than larger banks" and even when they are public "they are usually not traded on the major exchanges." Certainly most community banks hold stock charters (vs. mutual charters), but the FDIC also found that about 84% of community banks are privately held and the remaining 16% were in organizations (usually a bank holding company) that was publicly traded. Overall, only 5% of all community banks belong to organizations listed for trading on a major exchange (the rest are often OTC and thinly traded). Despite this backdrop, certain community banks who raised capital during the crisis (sometimes from institutional sources) are feeling pressure from activist investors (or directors). As the time nears for larger investors to monetize and get out, things sometimes ramp up and fights ensue. This can add urgency to proxy season for some, but it can also bring opportunity. Bank management teams and CEOs in particular, can leverage this annual opportunity to communicate directly with shareholders. This time of year is a great one to remind shareholders of your vision, deep roots in the community and what you do day in and day out as a community banker. Be sure to not only say thank you to them as a shareholder, but to give an extra shout out to those who are also customers. It is also a good time to brush up on your skills. 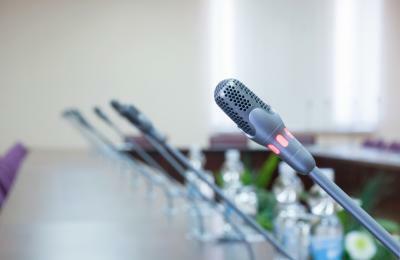 To run a successful meeting, the ABA suggests doing such things as: spending less time talking about last year; focus on where value for the bank is created and company direction. Be sure as well to essentially distill the bank's annual message to a few themes and then expand on those themes in the written annual communications (as well as at the meeting). All of these can be quite effective and keep shareholders happy. Before you go into the meeting, spend time to prepare. Bring in the management team and have the CFO play the role of tough investor. Orient the questions around what sticks out, what "big time" investors might ask, and make sure some are pointed and direct. Doing so gives you time to work on getting better and more precise answers. Starting early also gives you more time to think about things so you can tell a better story when you get there. Finally, while the annual report and shareholder meeting is focused on discussing company finances and strategies, the moment can also be leveraged as a way to engage with the community. Some banks even plan community events or celebrations around the annual meeting. No matter what this annual event turns out to be for your bank, given the structure of community banks we would venture to say very few ever have the likes of a Gordon Gekko showing up either so relax, take a deep breath, think about the strengths of your bank and all that you do for the community at large. It will get your mind into the right place and allow you to relax a bit more as you walk into the room and see you are there with friends. Despite positive economic data releases, yields were left unchanged. A report from the FBI offers the following prevention tips banks and your customers can take to protect against ransomware (malware that takes over a computer system until money is paid): ramp up awareness and training; end users are the target, so educate employees about this risk and what to do; patch operating systems, software and firmware devices; utilize ongoing centralized patch management systems; ensure anti-virus and anti-malware solutions automatically update and that regular scans are conducted; actively manage the use of privileged accounts (administrative access) to only give access to those who absolutely need it; configure access controls, including file, directory, and network share permissions, with least privilege in mind; disable macro scripts from office files transmitted via e-mail; use Office Viewer software to open Microsoft Office files transmitted via e-mail instead of full office suite applications; and implement software restriction policies or other controls to prevent programs from executing from common ransomware locations. A new report by Reuters indicates the New York Department of Financial Services is reportedly preparing to probe online lenders to determine whether lending practices comply with usury laws, among other things. Fed St. Louis President Bullard said in a speech that "labor markets are at or beyond full employment" and such a situation "may put upward pressure on inflation going forward." Bullard is expected to continue to support slow normalization of interest rates.